There are dozens of excellent reasons why drivers in and around the Braintree, MA area should choose our Toyota dealership, but our team has decided the ten most important reasons why you need to consider us first when looking for a new Toyota or a vehicle that's new to you. If you have any questions please contact our team through our online form or by phone at (781) 848-9300. Shop Three Floors Indoors. The unique three-story layout at Toyota of Braintree provides shoppers with an air-conditioned space in which to browse through the available models and check out all the features included without worrying about the elements. Location, Location, Location. Our Toyota dealership is located near the intersections of Route 3, Route 128 and the Southeast Expressway. No matter where you call home, you can find a direct route to get to Toyota of Braintree. Selection. With over 500 new Toyota and pre-owned cars, trucks, and SUVs on site, our Toyota dealership offers one of the largest vehicle inventories available to the Braintree, MA area. We stand behind our product. Every Toyota car, truck, or SUV that leaves our lot is backed by a 3-year/36,000-mile limited warranty, but the protection we offer isn't limited to a simple warranty. We also offer a 5-year/60,000-mile powertrain warranty and available extended warranty options. Every CPO model undergoes a 160-point inspection, while hybrid models are given a 174-point inspection. Auto service for everyone. Does your car, truck, or SUV require routine auto service or repair? The dedicated Toyota auto service center at Toyota of Braintree is the ideal location for drivers to keep their vehicles running at peak performance. We have over 35 service bays and 70 factory-trained auto service professionals on staff. Our comfortable waiting area offers free Wi-Fi, computer work stations, a children's play area, shuttle service, rental cars, loaner iPads, phone charging, and an in-house deli for breakfast and lunch. Diversity. The men and women that call Toyota of Braintree their place of work represent a rich blend of cultures, races, and languages. Our 150+ employees represent several countries and speak multiple languages. We offer an inclusive environment that recognizes our differences as part of our strength and success. Outstanding reviews. The feedback we get from our customers is absolutely vital to our continued improvement and development. Your experiences and suggestions have been the reason we have continued to deliver a first-class customer experience. See what others are saying, but also let us know how we're doing by visiting DealerRater.com. Support for charities and the local community. Over the years, our Toyota dealership has developed a unique relationship with our local community. 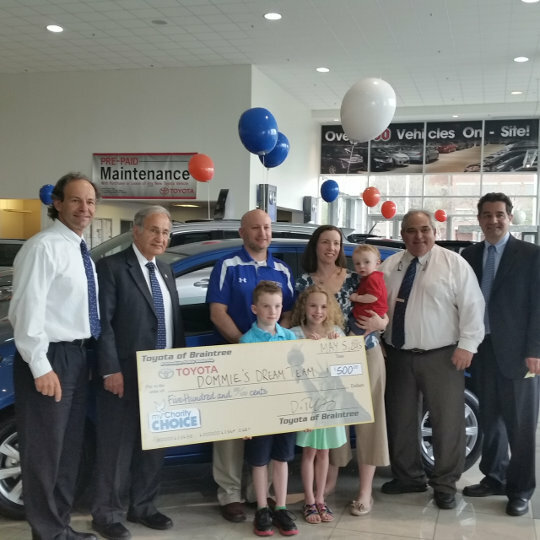 From teen driving clinics to our annual customer appreciation BBQ, and hosting the local Cub Scout Pinewood Derby, our dealership has shown an honest commitment to the Braintree, MA area. We've also initiated a giving campaign to bring additional attention and resources to charities in the area. Any non-political charity is eligible to participate. Go to our Facebook page to learn more about the current charity contest and nominate your favorite group. Good people. 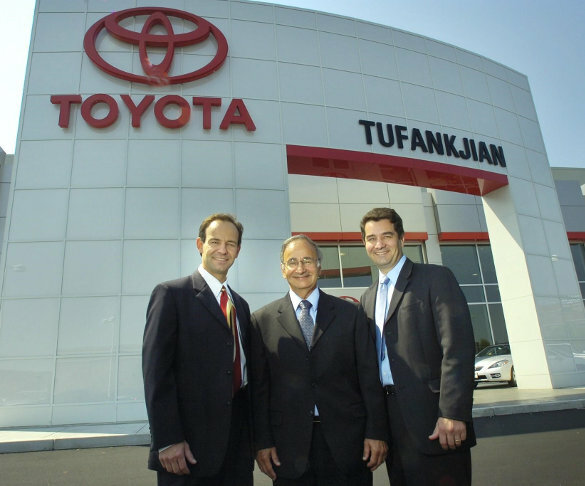 Our Toyota dealership is family owned, and maintains what we call the "Tufankjian Family Atmosphere," focusing on our guests and team members, while treating everyone with respect. As a guest at Toyota of Braintree, you're part of our family, and we'll always treat you like a one of our own. Outstanding Customer Service. The commitment to deliver a genuinely great customer experience displayed by the team at Toyota of Braintree is what truly sets us apart from our competition, and we have the accolades to back it up. 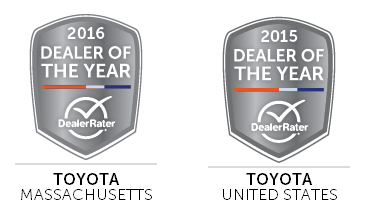 Our dealership has been recognized with the prestigious President's award from Toyota for the past seven years. Our Toyota dealership has exceeded industry standards for Sales Satisfaction, Service Satisfaction, Vehicle Delivery Excellence, and Employee Training. Stop by this week and experience what outstanding customer service truly is with the team at Toyota of Braintree. Do you still have questions about our Toyota dealership? Contact our team through our online contact form or by phone at (781) 848-9300 to get your questions answered quickly.